Bibliography: J. Kingma, A.K. Offenberg, Bibliography of Spinoza's works up to 1800, Amsterdam 1977; A. van der Linde, Benedictus Spinoza bibliografie, 's-Gravenhage 1871; A.S. Oko, The Spinoza Bibliography, Boston 1964; J. Préposiet, Bibliographie Spinoziste, Paris 1973 (Annales Littéraires de l'Université de Besançon, n. 154); T. van der Werf, H. Siebrand, C. Westerveen, A Spinoza Bibliography 1971-1983, Leiden 1984; J. Wetlesen, A Spinoza Bibliography 1940-1970, Oslo 1968, with a supplement from 1971. Updates of the bibliography of works by and about Spinoza are published annually in the «Archives de Philosophie». For internet updates see: Index du «Bulletin de Bibliographie Spinoziste» (literature by and about Spinoza, up to 1999) and Spinoza Bibliographie 2000. Inventaire des livres formant la bibliothèque de Bénédict Spinoza, publié d'après un document inédit, avec des notes biographiques et bibliographiques et une introduction par A.J. Servaas van Rooijen... notes de la main de M. le Dr. David Kaufmann, La Haye, Martinus Nijhoff 1889. The catalogue of the books belonging to Spinoza was drawn up by the notary Willem van den Hove on 2 March 1677; the money earned from their sale was used to pay the expenses of the funeral. In the first decades of the 20th century, based on that catalogue, the library was entirely reconstructed thanks to the location and acquisition of copies of all of the works listed in the catalogue by Baron Rosenthal, which he then donated to the Spinozahuis di Rijnsburg. 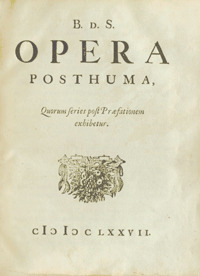 The catalogue contains 159 volumes, subdivided by format: In Folio (nos.1-24), In Quarto (nos. 1-55), In Octavo (nos. 1-39), In Duodecimo (nos. 1-41). 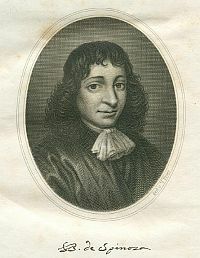 Ms. del regesto dei libri appartenuti a Spinoza redatto dal notaio Willem van den Hove il 2 marzo 1677.